FULTON – With renovations well under way for the new Community Arts Center in downtown Fulton, the Arts Center is continuing with regular programming at its alternate location. 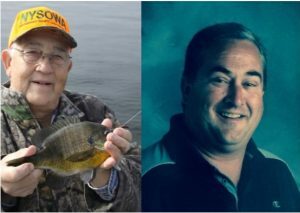 From left: Leon Archer, sports columnist and Dan Witmer, former coach of the Oswego Lakers will each present their newest books at CNY Arts Center’t Author’s Spotlight November 18. Author’s Spotlight and Top Hat Solutions Comedy night will each take place during November at the Arts HotSpot located at 47 S. First St.
Author’s Spotlight is a quarterly event that will be held November 18 from 2-4 p.m. It showcase books from two local authors, Leon Archer and Dan Witmer. Hailed as “not a typical romance novel, but a love story with a believable plot and captivating story line” the characters Roland and Sherry rediscover a relationship that began in high school but find things don’t always go according to plan. Copies of the novel will be available for purchase and signing. The second featured author debuting his first book is Witmer, a former coach of the Oswego State Lakers’ lacrosse team for nearly 30 years. After stepping down from the Oswego State Men’s Program in 2010, he began writing “Road Trip Dad” a blog for JustLacrosseUpstate.com as he followed his sons’ college experiences. Author Spotlight, a Q&A style event with book signings, is always free to the public. The event will be held at the Arts Hotspot, 47 S. First St., across from the gazebo. Top Hat Solutions will run comedy improv November 24 at 8:30 p.m., with Slouch Hat Solutions, the kids’ improv version, beforehand at 7:30 p.m.